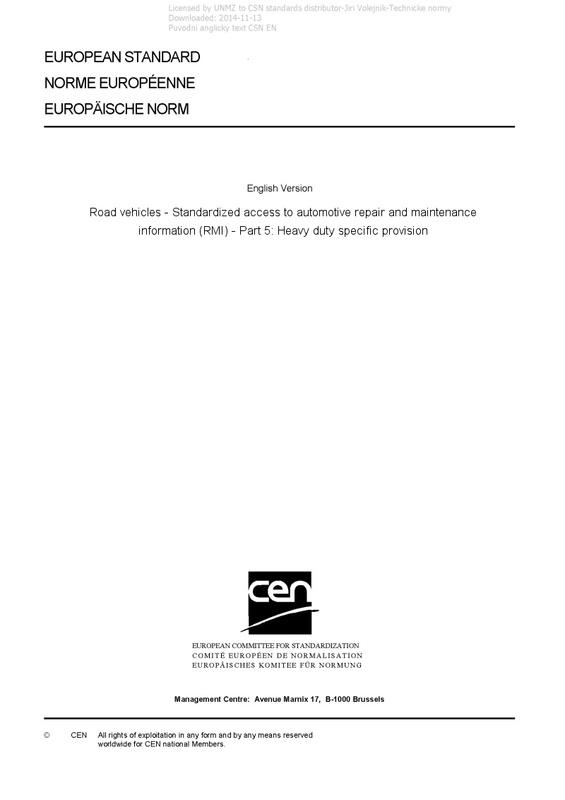 EN ISO 18541-5 Road vehicles - Standardized access to automotive repair and maintenance information (RMI) - Part 5: Heavy duty specific provision - This document focus on the access to automotive repair and maintenance information for — heavy duty motor vehicles as defined in regulation (EC) 595/2009 Article 2; — engines and after-treatment systems (family) if they are type-approved as a separate technical unit, e.g. according to Directive 2007/46/EC. This document includes a transposition of the standards ISO 18541-1:2014, ISO 18541-2:2014, ISO 18541-3:2014, and ISO 18541-4:2015 to these vehicle types and systems. The standards ISO 18541-1:2014, ISO 18541-2:2014, ISO 18541-3:2014, and ISO 18541-4:2015 focus on the access to automotive repair and maintenance information for passenger cars and light commercial vehicles. Remote Diagnostic Support is a specific requirement for Access to RMI for heavy duty vehicles. It will be addressed separately in a future standard. The standardized RMI terminology is contained in a ?Digital Annex' developed and maintained according to the complementary standard ISO 18542.